Dorie Greenspan wrote recently about her new cookie venture with “the Kid” (her son Joshua). Their menu sounds divine, and if you’re in New York this week, you might want to wander over and have a look. Of course, we’re on the other side of the world, but I decided to make a batch of her World Peace Cookies anyway. They’re so named because a neighbour of Dorie’s once declared that a daily dose of these cookies could bring lasting “planetary peace and harmony”. They’re dark, delicious and euphoria-inducing. A couple of these, and all seems right with the world again. This is the perfect cookie to go over the top with – source the best ingredients you can find and enjoy the extravagance of it all. I used the 75% Tanzanie Origin Chocolate that Joyce and Marty gave us for Christmas, and combined it with Callebaut Dutch Cocoa. 2. With an electric mixer (preferably a stand one, but hand held will work), beat the butter on medium until soft and creamy. Add both sugars, salt and vanilla and beat for a couple of minutes more. 3. Add the flour mixture all at once and mix together at low speed until just combined, mixing the dough for as little time as possible. Add the chocolate callets and mix just to incorporate. 4. Shape the dough into two logs about 4cm in diameter. Wrap well in either cling film or parchment paper and refrigerate for at least three hours. The dough can kept in the fridge for three days, or frozen for up to two months. 5. Preheat the oven to 160C (I used 150C with fan, but my oven runs quite hot). With a thin sharp knife, cut the dough into slightly thicker than 1cm slices. The discs will split and crack, particularly if you’re using large chocolate chips like I did – just squeeze them back together again. 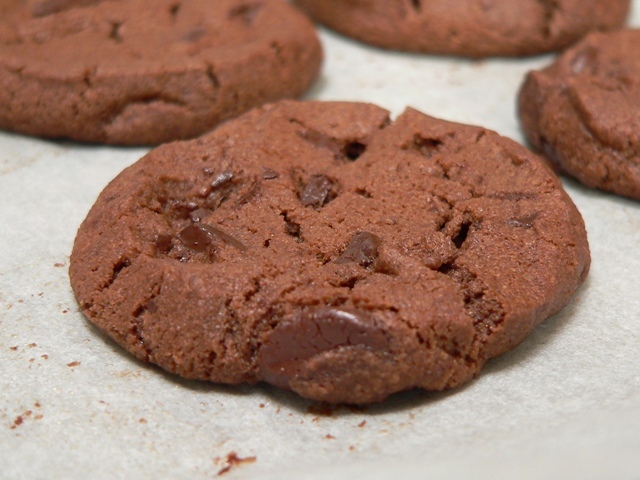 Note that Dorie uses mini-choc chips, which would make the dough easier to slice. Arrange the rounds on parchment lined trays, leaving room for them to spread. 6. Bake the cookies for 12 minutes, or 13 minutes if baking from frozen. They won’t look firm or set, but leave them on the trays until cool, and they should carry over cooking to crumbly perfection. These cookies are quite fragile, so you’ll want to package them carefully. They keep for a few days in an airtight container, or for a couple of months frozen, providing they’re well sealed. Oh wouldn’t it be wonderful if the world could be sorted out with Chocolate! I guess I’ll just have to make some to do my bit towards world peace. Oh I’ve heard so much about these cookies, I should really give them a try! :D I think calling them World Peace Cookies is a stroke of genius. You’d always remember them from the name! I so agree with Choclette. If only! Can I have one anyway – they look so scrummy. They’re very moreish, Oz! But I think you have to be a fan of dark chocolate, and for some reason I thought you preferred milk? Thanks for sharing this recipe! Just wondering, how many cookies would one batch yield? Also, would substituting the dark chocolate with milk chocolate be an viable option?